These days bike riding has become a popular form of transportation for adults as well as from of exercise. There was a time when bike riding was mostly a kid’s activity. That has changed and most regular cyclists are over the age of 30. Still, it has remained a fun activity for children as well. While a lot of the accidents we see in Boston involve commuters who are hit by cars on their way to work, we still see many cases involving young bike riders who are hit by cars. According to a recent news article from the Boston Herald, a young child and his father were struck by a car as the father was walking aside his son who was riding his bike. Authorities have said the Boston bike crash resulted in serious personal injury to both the child and his father. Witnesses have said the car was a black sedan and had the word “Seniors” painted on the windows indicating that the car was being driven by high school senior.As our Boston bike crash injury lawyers can explain, while car accidents involving teen drivers are more typical during the Hundred Deadliest Days of Teen Driving between Memorial Day and Labor Day when teens are out of school, teens drivers are involved in serious and even fatal Boston car accidents throughout the year. And some of these accidents involves bicycles. It is alleged that when the father was walking next to his son on the bike, the SUV crossed the center lane of travel and crashed into the two victims. The child was six-years-old. Neighbors who saw the bike crash and those who heard the loud crash ran over to offer assistance including dialing 911. These bystanders saw the boy’s bike crushed beneath the SUV and another car that was also involved in the crash. They told the father to not move and said they were going to get help. It is very important not move anyone who is may have suffered a spinal cord injury or a trauma to the head or neck. Before first responders arrived at the scene of the Boston bike crash, one woman who identified herself as a trauma physician began offering assistance until EMTs arrived. Once EMT’s were on the scene, they took over treatment and transported the two victims to separate Boston area level on trauma centers. The child was taken to a pediatric trauma center. Their injuries are reported as being serious, but their exact conditions were not released. The police are conducted an investigation with complete accident reconstruction, but suspect the cause was accidental. There have been no reports of any negligence in connection with this accident as of this time and not charges have been filed against the driver. 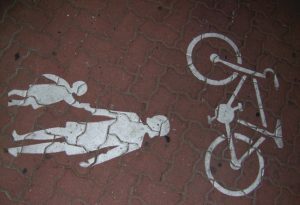 While people often use the term Boston bike accidents or car accidents, many so-called accidents are really examples of negligent conduct. This means they while they fit the common English usage of an accident, they are actionable in the Suffolk Superior Court. Negligence is one type of tort. The other type of tort is an intentional tort. Intentional torts can include assault, battery, assault and battery, arson, false imprisonment (civil kidnapping), conversion of chattles (property), trespass to chattles, invasion of privacy, and various others. As the name implies, intentional torts are where there was a general or specific intent to harm another. The duty is a duty of due care to act as a reasonable and prudent person so as to avoid foreseeable harm to foreseeable persons and property. If a person is driving a car and is distracted by something like a smart phone or simply not paying attention, and crosses the center lane of travel and hits a bike rider, this could be an example of negligent conduct. When the police say something appears to be an accident, they mean it is not criminal. This essentially means the driver was operating under the influence of alcohol and or/drugs, and wasn’t involved in a street race or some other type of illegal conduct. This doesn’t mean that the driver will not be liable in a civil action following a Boston bike crash. There is a high probability that even if the police say is was an accident, they will issue one or more moving violations. Cross the center lane of travel is a moving violation in the Commonwealth. If you were involved in an accident while riding a bike, the best thing you can do is to speak with an experienced Boston bike injury attorney as soon as possible. These cases are similar to typical car accidents, but there are many nuances that may arise. One is the cost of the bike itself. While this may come as shock to those who do not ride, not all bikes come from a big box retailer and cost around $200. It is not uncommon for a serious rider to be riding on a bike that cost more than $3,000, and this is something for which you should be fully compensated. This is in addition to the issue of bicycle accidents often involving much more serious injury than we see in some car accidents because the bike provides much less protection than a car, even if the rider is wearing a helmet. This is however, not something the defendant can hold against the plaintiff in most cases, and you should discuss this issue with your Boston bike crash lawyer during the initial consultation. This comes from a legal doctrine called the eggshell skull doctrine that requires a defendant to take the plaintiff as he or she finds him.